A powerful blast of air in the palm of your hand! Instead of waiting for your vehicle to dry itself, blast water away with the Metro Blaster SideKick. The compact Blaster SideKick is a hand-held companion to Metro's popular Air Force Blaster. 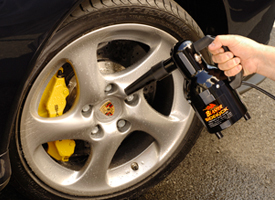 The SideKick blasts your car or bike dry before water spots form. Hit the road faster with the Blaster SideKick! The Metro Blaster SideKick is an compact, handheld dryer for motorcycle and car owners because it removes water from places where towels cannot reach. When the vehicle or motorcycle is driven, these water droplets stream down the body panels and leave streaks and spots. The Blaster SideKick eliminates the water in crevices and on body panels before it has time to dry, in order to prevent ugly water spots. Imagine drying your vehicle in just a few minutes without touching it. 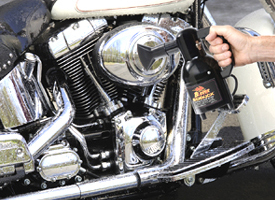 The Blaster SideKick allows you to dry the vehicle or bike with a large volume of warm, filtered air, which eliminates any direct contact with the paint. The SideKick is a safe and efficient way to dry any vehicle. The Metro Sidekick dries motorcycles, wheels, engines, mirrors, and anywhere else moisture hides! The Metro Blaster SideKick weighs just over 3 pounds, making it an excellent travel companion. The SideKick fits into saddlebags or into car trunks so you can blow dry your vehicle or motorcycle when you're away from home. When prepping for a car show or bike event, the portability of the SideKick is a real asset. 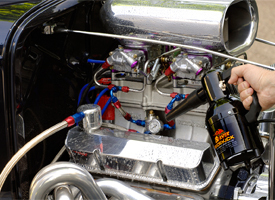 The Blaster SideKick runs on a 1.3 HP motor powered by a 12 inch grounded cord. It includes a rubber neoprene blower nozzle to direct air into tight spaces and an air fan nozzle for drying body panels. The SideKick is constructed of all steel in the U.S.A. and carries a 1 year manufacturer's warranty. Don't give water spots a chance. 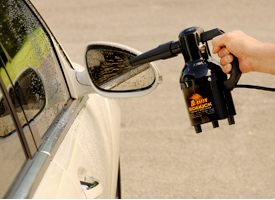 The Metro Blaster SideKick blasts away water with warm, filtered air to leave your vehicle or bike dry and spot-free. So you dried off your entire vehicle using the Metro SideKick and the softest, most absorbent towels known to man - the Waffle Weave Guzzler, but when you walk out to the vehicle a couple hours later your worst nightmare becomes a reality - drips of water have created unsightly water spots! Don't sweat it; these annoying droplets of water are bound to happen, no matter how careful you are. They come from behind emblems, in between body panels, fuel filler doors, and any other crack or crevice where water can hide. Don't panic and grab a towel only to vigorously rub the surface, inflicting toweling marks (fancy for scratches). Instead, grab a bottle of McKee's 37 High Gloss Detail Spray and a Gold Plush Jr. Microfiber Towel. Spray the affected area and wipe away the water spots, it's that easy! You'll appreciate the added gloss and slickness, so much so that you might even be tempted to wipe down the entire car (go for it!). Additional discount codes do not apply to this item. Expedited and international shipping are not available. Bought this to use on my motorcycles but it's very useful on my other vehicles as well. Had more air pressure than I would have thought. I would recomend it definetly. Compact but with enough power to get the job done. I use this on my sedan and it works great, at first I was expecting a small bit of air due to the size, however dont judge a book by it's cover. This product rocks wonder where I was all my life without this product. I can use it dry the whole car or even reach to the cracks it works great. Im happy I went with this product instead of the the bigger one. ProsDrys well, extremely powerful for such a compact machine, the covers are plastic and wont scratch your car, it is high quality made in usa you can tell the quality as soon as you open it. Conswish the cable was a little longer because you have to use an extension anytime you use this. Just purchased the Sidekick and must say I am impressed. For such a small and light unit, it packs quite a powerful blast. I would recommend this to anyone. Cons- The power cord on it is ridiculously short. About a foot long. I understand it had to be plugged to an extension cord, but come on, it barelly has enough leght to do the dictonnection protection knot.